Yoruba Andabo en el Teatro Artime en Miami! Corre la noticia! Founded in 1961, Yoruba Andabo enjoys a special rapport on and off the island, as is a true example of authenticity and versatility to take on folk and popular traditions, from the great diversity of Cuban culture. 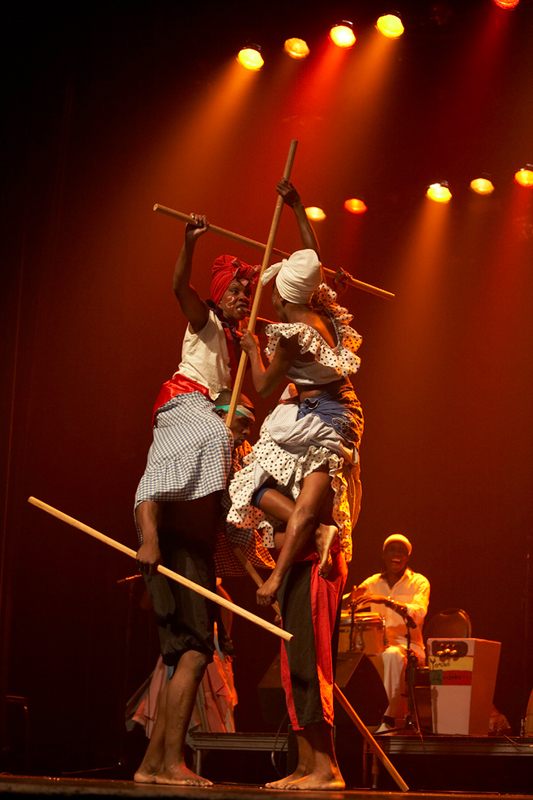 With a hallmark, the cast grown dissimilar genres that make up the African roots on the island as the Congo, Yoruba, Abakuá and called Rumba complex, with its traditional rhythms, especially yambú cycles, guaguancó and columbia, creating contemporary sounds and voices. Rumba, which was born long ago in slave barracks, cane field settlements and urban tenements, is heard today in the world’s most prestigious venues, such as New York City’s Carnegie Hall. 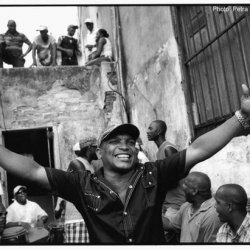 Rumba does not go out of style and the Cuban genre is now experiencing its greatest popularity, an explosion no less surprising than the group Yoruba Andabo. Many of the group’s tracks have made the hit parade charts of Cuban radio, not to mention Cuban stages, especially La gozadera, with the powerful earthy voice of lead singer, or akpwón, Ronald González, backed up in the choruses by Jorge Luis Hernández. Yoruba Andabo holds a peña (a short, informal concert) every Sunday at the Galiano Casa de la Música, whiich is always filled to capacity, well before it begins at 5:00 pm. Group leader Geovani del Pino has attracted rumba as well as salsa lovers, and is now preparing a Saturday afternoon peña at the Las Vegas cabaret. “It’s like a fever,” an international visitor tells me, “The fury for rumba in Cuba is amazing.” A great number of tourists are intent upon seeing a performance of the genre, considering it a kind of musical reflection of the country. Traditional or folkloric music has often been viewed as “museum” music, reserved for specific events, but visitors want to know Cuba’s most authentic, original music. Yoruba Andabo’s producer tells me that the Cuban label Bis Music will release the groups new disc, Cántalo y báilalo como yo, while Del Pino recalls that the group made a huge splash at New York City’s music mecca, Carnegie Hall, November 30, 2012. Tickets were selling for $300, three months before the concert, which was the first by a Cuban rumba group at such a prestigious venue, and the spectacle was expected to be of the highest level. Yoruba Andabo arrived at Carnegie Hall as part of the Festival of Latin American Voices, along with Cuban musicians Chucho Valdés, Aldo López Gavilán and Dayami González. The group recently performed in London’s Barbican Centre, during the Nations Dance/ Cuba50 Festival, in which the renowned Cuban bands Orquestra Aragón and Los Van Van also participated. Yoruba is the name of an extensive area in West Africa, and Andabo, in the Carabalí language means friend, follower or admirer, reflecting the rumberos aspiration to be something like the followers of Yoruba culture. The group was born on the docks of Havana Bay in 1961, when a group of workers got together to create the Maritime Port Guaguancó. In 1985, they took the name Yoruba Andabo and began their professional work performing during the Peña del Ambia (Eloy Machado) at the Union of Cuban Writers and Artists (UNEAC). Ten years later, during the height of the Cuban salsa boom, they became the Yoruba Andabo Folkloric Company, composed of 17 singers, percussionists and dancers. They cultivated different genres of rumba, both secular and religious, with a rich, broad repertory including a Congo cycle, a broader Yoruba and Abakuá one, as well as rumba based on the most traditional rhythms such as Bambú, Guaguancó and Columbia. Its music is enriched with carefully studied and executed choreographies, which incorporate Cuba’s longstanding Carnival conga tradition. Yoruba Andabo has performed across the country and around the world, at renowned venues such as Colombia’s Teatro Colón; Harbourfront Centre in Toronto; and Aaron David Hall in New York; and has shared the stage with Tata Güines, Pablo Milanés, the Buena Vista Social Club, Chucho Valdés, Joe Arroyo, Lázaro Ross, Gonzalito Rubalcaba, Grupo Olodum, Niche, Diablos Danzantes de Oaxaca, Maracas, Celeste Mendoza and Cuba’s National Symphony Orchestra. Yoruba Andabo was featured as a special guest on the discs La rumba soy yo (2001 Latin Grammy) and Tremenda rumba, by Maracas y Nueva Visión, nominated for a Grammy in 2003. In 2006, the group received two nominations from the Academy of Traditional Music, in the Best Album and Best Audiovisual categories, for its CD-DVD Rumba en La Habana… con Yoruba Andabo, which was also nominated for Cubadisco 2006 awards. This year, the group is making plans to celebrate its 30th anniversary, September 24, looking to a bright future for rumba which was declared a component of Cuba’s Intangible National Heritage in 2012, and continues to influence a variety of other genres including salsa and timba. Cuban Ministry of Culture, Cuban Embassy, ComoNo, Music Fund for Cuba, Cuba Solidarity Campaign, Unison, Unite, Thompsons Solicitors, Cuban Tourist Board and business, community and cultural organisations based in the UK and Cuba. 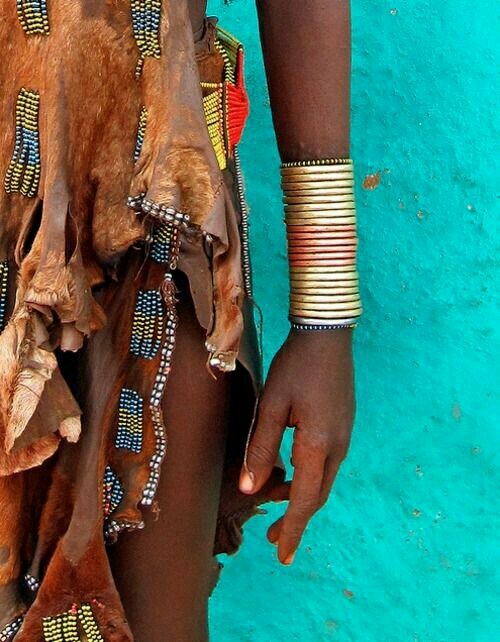 Various cultures throughout the world believe that the human body is an ephemeral vessel for the soul. Amongst the North American Hopi and African Yoruba there exists a conviction that spirits can also endure within the confines of small wooden effigies, respectively called Katsina dolls and Ere Ibeji. The Hopi Tribe, a sovereign nation located in northeastern Arizona, spans 1.5 million acres and comprises 12 villages across three mesas. The Yoruba primarily occupy the city of Lagos, situated in southwestern Nigeria, though they have also migrated to cities in neighboring countries. 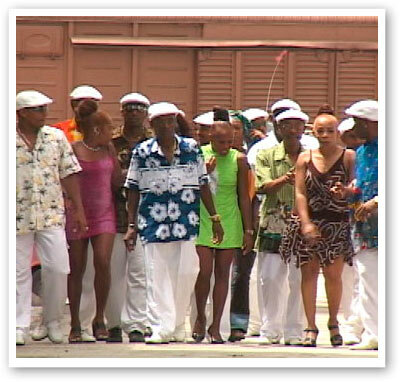 This group had its genesis in the Havana Docks where, in 1961, a group of workers met and created what was known then as “Guaguancó Marítimo Portuario.” When they became professional, the group was re-baptized “YORUBA ANDABO” when, in 1986, they started working in a series of activities for and with the Union of Cuban Writers and Artists (UNEAC). These activities were organized by Cuban poet Eloy “The Ambia” Machado, who put the group in contact with singer and composer Pablo Milanés, who invited them to participate in the celebrations for the 25th Anniversary of the record company EGREM. From that moment on they started carrying out important work with folk singer Merceditas Valdés. In 1994, as they stepped into a new working stage, they adopted the name Folkloric Company YORUBA ANDABO. • Congo Cycle where they do the three types of Palo, Makuta and Yuca singing, with instruments such as the Mula, Cachimbo and Caja drums, including the use of the Catá and the Aggogo. • Yoruba Cycle ranging from singings and prayers, working with the Bata drums orchestra and the Chequeré, to the profane type of “Bembé” or “Güiro”, all of them with the Oricha dances such as: Elegguá, Oggún, Obbatalá, Yemayá, Babalú, Changó and Oyá. 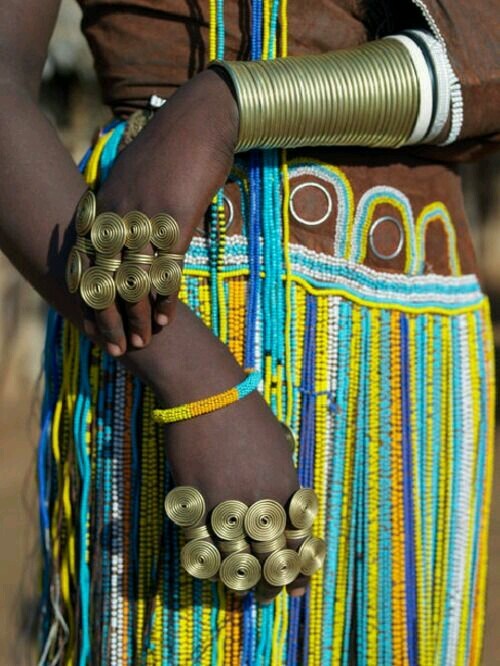 • Abakuá Cycle including the liturgical singing and prayers, with the complex execution of the Tankomo drums and the colorful dances of the Iremes or “little devils”, symbolizing the spirit of the dead. • The Rumba Cycle with this cycle YORUBA ANDABO specializes in rescuing the traditional rhythms as the Yambú, the Guaguancó, and the Columbia, performing them with the original instruments. The company also offers workshops and seminars on Folkloric Percussion, Folk Dances and singing, Popular Percussion and Popular Dances. These educational activities are carried out by well known specialists who are members of our staff. The spirit of the rumba is the name of the show today at 5:00 pm, will present the Cuban group Yoruba Andabo in the Alameda Theater, located in the parish of St. Augustine. This will be the third concert offered by the group, since his arrival in Venezuela last July 23 for the second time this year. The first of the presentations was in the state Yaracuy, where they released to the Venezuelan people, a rumba-time version of the song popularized by Ruben Blades, Maria Lionza. The second presentation took place in the mountains of Sorte, there they sang the theme that will be contained in the next album from this company born 30 years ago to the goddess. “It was a very beautiful thing in the magic and atmosphere that was created who welcomed us and explained that this (Maria Lionza) is a representation of one of the goddesses of Afro-Cuban mythology, the goddess Oshun,” said manager Company and producer Jose Lobato, in an interview with CCS City. About his upcoming show at the Alameda Theatre, Lobato said the entire group is very excited and with great expectations after a tour of the parish of St. Augustine. “There is a wonderful atmosphere, the audience knows the work of Yoruba Andabo long and joyfully await us,” he said. Within the repertoire will present the items on his latest album, also titled The Spirit of the rumba and “one box with the Yoruba Orishas African Pantheon”, the Congo and Abacuá. The manager also said on Sunday presented his show, this time in the Juan Bautista Plaza Room of the National Library at 2:00 pm. 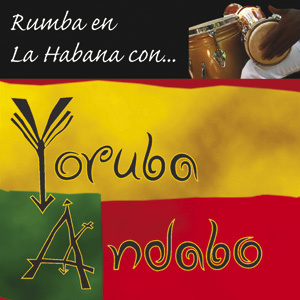 Andabo Yoruba consists of six musicians, five percussionists and two dancing couples onstage ranging from 19 to 77 years old, spreading the congo beats, Abacuá and rumba, with the dances that make up the Cuban popular expressions. In this regard, he said Lobato defend their culture is one of the most important work they do as a group. “The defense of the identity of the Americas by promoting respect for indigenous values, does not mean they are static, in contrast, continue to evolve with new rhythms, with a new approach, but always letting us know where we come” , he said. Yoruba Andabo has presented its show at important venues in countries like France, the United States, among others.